Welcome to Logged Off! 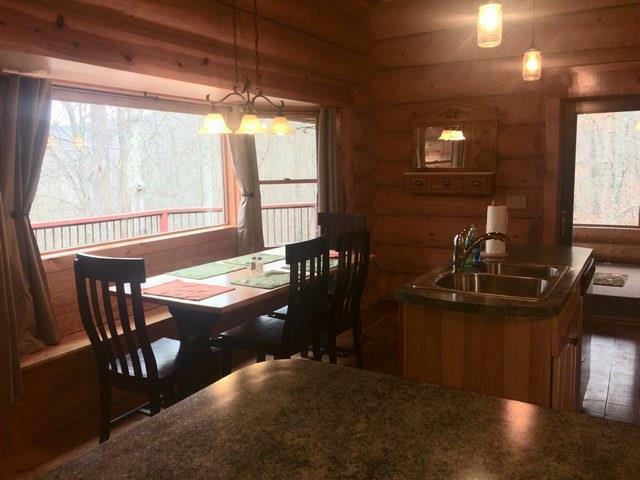 This wonderful log cabin is situated on a private 4 acre lot near Hot Springs, tucked away in the woods. You will feel like you are a million miles away from the hectic world while still being just minutes away from all the amenities Bath County has to offer! This home now has four bedrooms and three full bathrooms. The main floor master bedroom with queen sized bed has its own private bathroom with shower and claw foot bathtub. In addition to the master, there is another main floor guest room with a full bed and a second floor bedroom with 2 twin beds. The open loft area has a futon that can also provide sleeping space for guests. The full bath on the main floor is located off the hallway and serves the two bedrooms. And NEW for 2018 - the lower level bedroom has been freshly painted, furnished and trimmed with a king bed for another sleeping space with use of the third bathroom with shower. 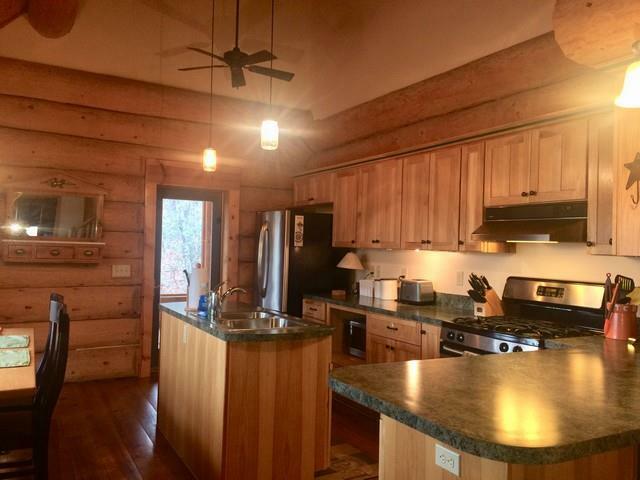 The heart of this home is the vaulted main floor great room with ample seating and cozy wood burning stove - great for sitting and relaxing. The kitchen is well appointed with a comfortable, spacious dining nook with built-in bench seating with everything you should need to dine in home as desired. 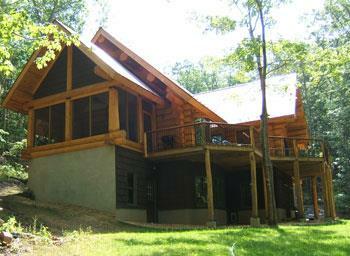 The expansive back deck spans the length of the home and provides a great place to relax and enjoy the outdoor space. 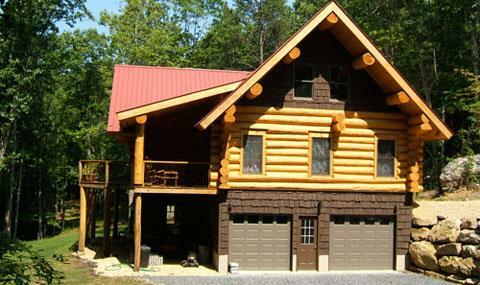 Additionally, there is a large, furnished porch with electric that is screened in from the elements allowing for enjoyment of the outdoors regardless of weather. The unfinished walk-out basement offers a ping-pong table for kids to enjoy even when the weather outside is not cooperative to outdoor play! 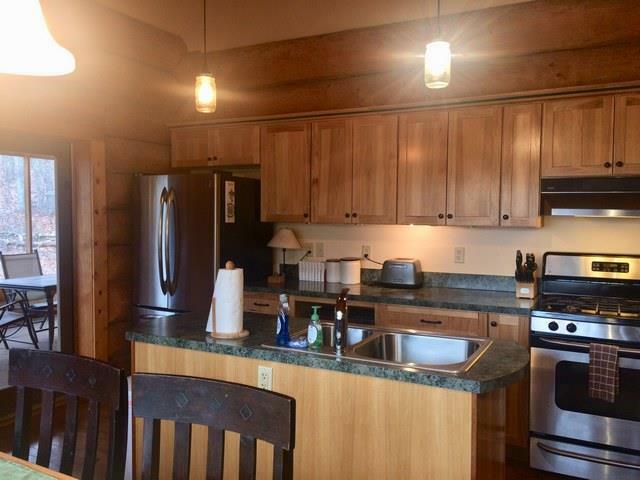 Additionally, there is a full sized washer and dryer that is readily available for use by our guests. Home is electronic friendly with land line phone, satellite DishTV and high speed wireless internet for our guests. Guests at Logged Off have close access to a wealth of outdoor activities year-round to include hiking, skiing, fishing, etc. Location is in close proximity to The Omni Homestead, Lake Moomaw, Douthat State Park, George Washington National Forest and more! 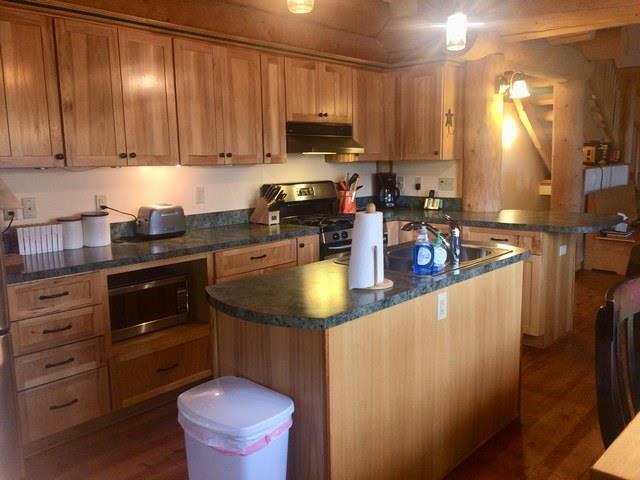 This is more than just a vacation rental, this is our home for a good portion of time and we hope that you will enjoy your time here as much as our family does! This home is a PET FREE & SMOKE FREE property. PLEASE NOTE: The driveway is quite steep going down to the house. Most cars should have no problem but an AWD or 4WD car may be preferred. There is a parking area at the top of the drive for those who would like to leave a car there and shuttle with other guests. Four-wheel drive/AWD and/or chains are required if there is snow!